I had a few Apple gift cards laying around and now using apple's Touch ID more often, I wanted to place these into Passbook for safe keeping and easier access. So how do we go about adding Apple gift cards to Passbook? First, the simplest way to add a gift card to passbook is tapping the "Add to Passbook" button when receiving a gift card over email. It looks something like this. 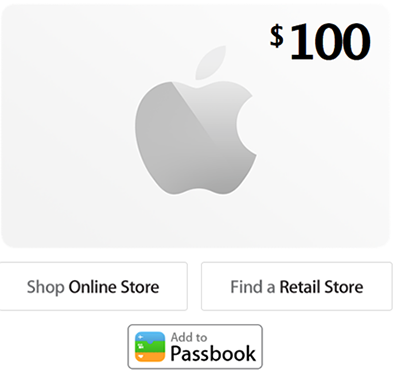 However, what if you already have a physical gift card and want to add this one to Passbook? It turns out it's not too easy or straight forward. Some people recommend downloading the Gyft iPhone app which allows you to import many gift cards from many merchants, however I'm a little skeptical of adding them to an app from a 3rd party other than Apple. This app, and others similar to it, require you to enter all the confidential information from the gift card into the app and transmit it over the internet to their servers. Although I'm pretty sure these are legit applications, I still had concerns over the security of my information. Are the connections from the app to their cloud servers secure? How secure are the servers themselves, etc. where 9999... represents the card number and AAAA... represents the PIN of the card. I added all of my remaining cards with out issue.